Basma El Husseiny is a cultural manager and an activist who has been involved in supporting independent cultural projects and organizations in the Arab region for the past 30 years. Basma was previously the Media, Arts & Culture Program Officer for the Ford Foundation in the Middle East and North Africa, and the Arts Manager of the British Council in Egypt. In 2009, Basma co-authored the EU report: Towards a Strategy for Culture in the Mediterranean Region. 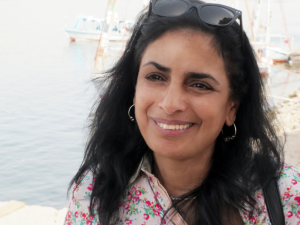 Basma is a UNESCO expert in cultural governance and a member of the Arab Cultural Policy Group. Basma El Husseiny founded in 2004 Culture Resource (Al Mawred Al Thaqafy), the Arab region’s leading independent cultural organization, and was its director until September 2014. In 2006 she also co-founded the Arab Fund for Arts & Culture (AFAC), and was a founding trustee until 2009. In early 2015, Basma founded Action for Hope, a newly established organization that seeks to provide cultural relief and cultural development programs to communities in crisis, with a focus on refugees and impoverished communities.